Today, a big plus, if you are competing in the world of smart home devices, is to be Alexa compatible. Many manufacturers are aware of this fact and they made their brands working with Alexa in order to improve the complete smart home experience. The following are the most popular, Amazon Alexa compatible and highly rated smart thermostats currently on the market. Even though the Nest Thermostat was one of the first smart thermostats, and it still is on the top of wold of smart thermostats. The Nest has a great design and bright LCD screen combined with a remote energy handling and many money-saving tools for better managing of your home’s environment. But what does Learning stand for? Learning means it can sense when you’re home or when the humidity gets too high and adjust itself. This thermostat learns your preferred temperature and humidity settings from your manual adjustments and improves your home’s temperature with no manual programming necessary. Connects to your Wi-Fi so you can control it remotely from a tablet, laptop, or smartphone using an app. 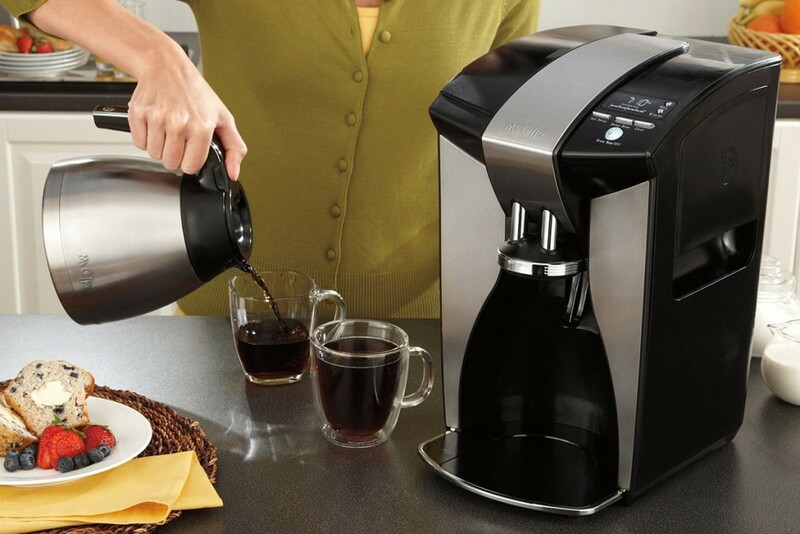 Auto-Away option automatically reduces the temperature to your pre-set minimum when you are away. Auto-Schedule remembers the temperatures you prefer throughout the week and adjusts itself automatically. Energy history shows you how much AC or heating you have used in the last ten days and why. After analysing the account, you can adjust your settings to save money. Airwave saves on cooling costs by automatically reducing AC runtime when humidity is low. All Nest settings can be controlled by either spinning the ring or pushing on the device face. The display is red when heating and blue when cooling. The Nest is easy to install, and with a bit of know-how and clear instructions, it can be fixed within 30 minutes. The Nest lacks external sensors, and that is one thing that users mostly complaint. So, you can’t feed Nest temperature or data from other locations without hardware, for example when the Nest is installed on a floor that is not used as often or in a hallway that is rarely used. 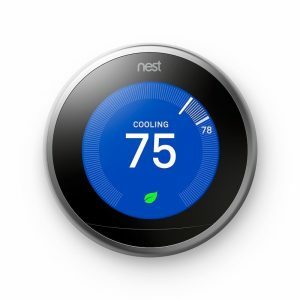 Energy usage, savings reports and intuitive design are Nest’s most famous feature among users. 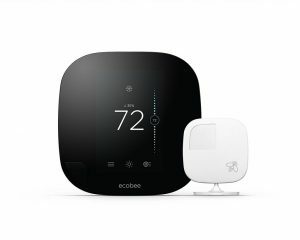 The Ecobee3 thermostat is Nest’s primary competitor, as it offers some unique advantages over the Nest, especially if you have a large home with a single HVAC system or you want to measure the temperature in rooms where the thermostat is not installed. The Ecobee3 features a touchscreen that you use as a smartphone app. Therefore it is easier to access information at the finger-touch. This model is more tech advanced compared to others, and it offers several unique features, most importantly, remote sensors. 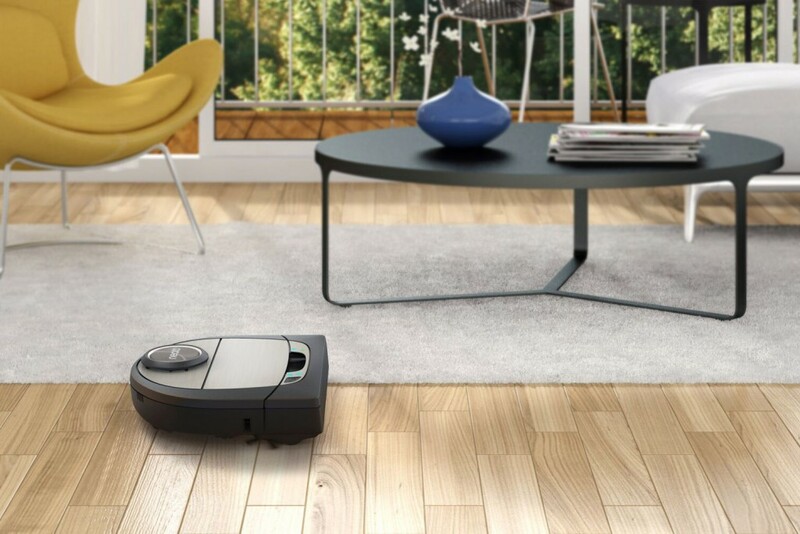 It comes with a single battery-operated sensor that you can place anywhere in the home. This sensor monitors occupancy and temperature so the device can better control temperature and occupancy throughout the house, not just the room where the thermostat is installed. One remote sensor to measure temperature and occupancy in a room distant from the place where the thermostat is. Up to 32 additional sensors can be installed at an additional cost. Control your HVAC system remotely from the mobile app. Automatic schedule programmed upon installation based on your geographic location. The Ecobee3 turns on your heating or cooling based on your home’s energy profile and outside weather. Intuitive interface with a large colour touchscreen. Users have pointed out several drawbacks to the Ecobee3 thermostat. This model is harder and more expensive to install than other ones if your home doesn’t have a common wire because it has high power needs. Users have also complained that the smartphone app sometimes quits randomly and is less than responsive when it works. Emerson Sensi is an excellent smart thermostat and a well-liked alternative to fancier smart thermostats. It has a traditional look and is very slim against the wall so it might suit your home interior better than some of the more futuristic-looking thermostats. Setting up an account can only be done through the mobile app, and if you like it better, you can also use the free Wink app instead of Sensi app. You will receive instruction for installation through an application. You’ll need the access code found on the back of your Sensi during setup so, be sure to write down before you mount it to the wall. You can control Sensi directly through the interface. But, the real benefit lies in the free app that’s compatible with both iOS and Android and works with Amazon Alexa. You’ll be able to take full control of your thermostat and check humidity, temperature and fan settings from the mobile app. 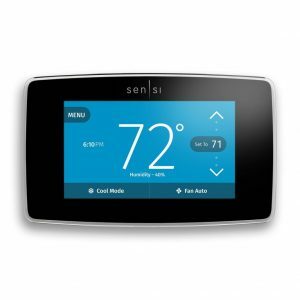 The Sensi is compatible with the majority of combined HVAC systems. No C-wire is required for most systems; the only exceptions are 2-wire heat-only systems, heat pump systems, and AC-only systems. There are several significant benefits of Emerson Sensi: you can program each day individually or in groups, control of temperature is precise: +/- 1 degree, and you can access settings, schedules, and current mode of operation via an app over Wi-Fi. All your Sensi thermostats can be controlled from a single app on your mobile phone. Additionally, if you own multiple homes, a business, or some rental properties, you will have the ability to monitor and adjust the energy use of each property from your mobile phone. Considering all mentioned, we can say that Emerson Sensi is an excellent choice if you are looking for a basic smart Wi-Fi thermostat within a reasonable price range. The First Alert Onelink enabling you to control the temperature of your home from anywhere with the free Onelink app via your Wi-Fi. Its software allows you to upload personal photos to create wallpaper background. It is easy to install and use – from a mobile app on iOS or Android and is also compatible with Alexa. You can set a program from the airport before you leave for vacation, or turn up the heat before you get home on an extra cold day. The thermostat has dual zone capability, so there is no need for manual switching from heating to cooling. Time scheduler automatically changes the temperature and set modes for up to 4 periods per day. Aside from a nice touch regarding wallpaper creating, there is another one. You can SMS your thermostat from a smartphone. It also displays current outdoor temperature reading and a forecast for 3-day in advance to help you set cooling and heating schedules. The thermostat monitors energy usage so you can quickly check how much energy has been used to heat and cool for the past seven days. So, with good analyses and planning, you can reduce your monthly costs for power and gas. 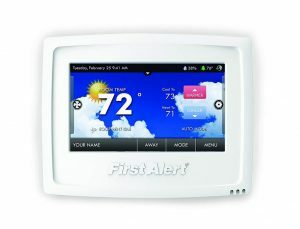 Send text messages directly to your thermostat screen. Change thermostat settings by two degrees without specifying degrees by asking Alexa to heat, cool, increase, or lower thermostat temperatures. Displays current outdoor temperature reading and a three-day weather forecast. Nice small additions can be attractive, but First Alert Onelink Thermostat is still more straightforward than some others of the similar price. Honeywell Smart Wi-Fi Thermostat is one of the most affordable smart thermostats. 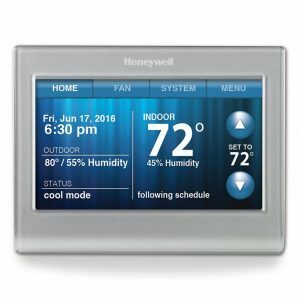 If you like the look of a traditional thermostat, but you want something that is more adaptable with remote HVAC control, the Honeywell may be a good choice. Besides its ability to match the touchscreen display to the wall or any other colour you choose, this thermostat offers some neat tricks to make it stand out from the competition. The Honeywell smart thermostat learns how long it takes to heat or cool your home, and adjusts its energy waste accordingly to the minimum. It will also alert you both via email and smartphone when you need to change your filter when your home exceeds set temperature and humidity extremes, or even when your Internet connection goes down. The ability to choose the display’s colour scheme. Indoor humidity sensor reduces air conditioning costs. Compatible with heating and cooling systems as well as heat pumps. Some users didn’t like that the Honeywell can’t learn from your manual temperature adjustments the way other models could. Another complaint is its relatively basic and blocky design that’s smaller than it looks. But as it doesn’t affect its function, we shall not count it into a more serious complaint. If you wish to read more about smart thermostats, check out our reviews about the best smart thermostats and the best z-wave thermostats.